The final title to complete my Atlantic Library set. An important addition to the collection, and increasingly difficult to find. Like other titles in the New into the Collection category this title is not for sale or trade. Frances Lengel [Alexander Trocchi], 1954 FRANCES LENGEL | THE CARNAL DAYS | of | HELEN SEFERIS | THE ATLANTIC LIBRARY | published by |THE OLYMPIA PRESS | 13, rue Jacob, Paris Collation: 192 pp. -128. 17.6 x 11.4 cm., all edges trimmed. Printed on white wove paper. Contents: pp. [1-4] blank. 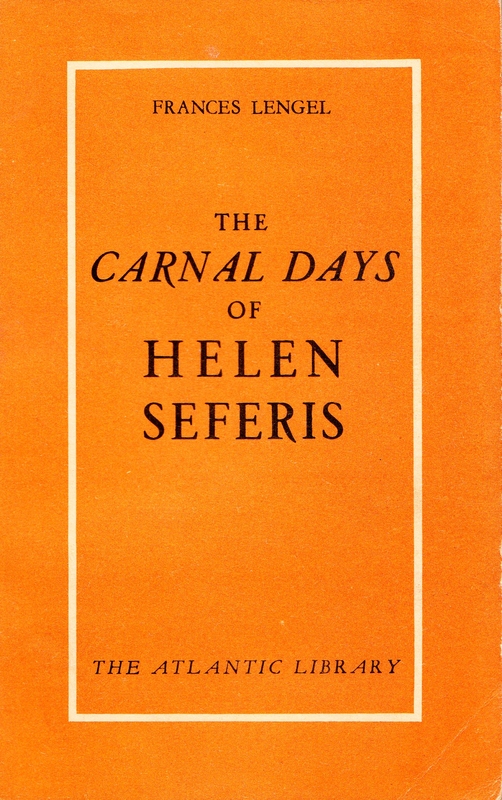 p.  THE CARNAL DAYS |of | HELEN SEFERIS, reverse blank. p.  title, as above. p.  Printed in France | [rule] | Copyright 1954 | by The Olympia Press, Paris. p.  Introductory note. p.  blank. pp. 11-183, text. p.  blank. pp. [185,6], catalogue of all ten volumes of The Atlantic Library series, with descriptive matter for each. p.  PRINTED MAY 1954 | BY IMPRIMERIE RICHARD, PARIS | Dépôt légal : 2e. trimestre 1954. pp. [188-192] blank. Binding: Orange wrappers, trimmed flush. 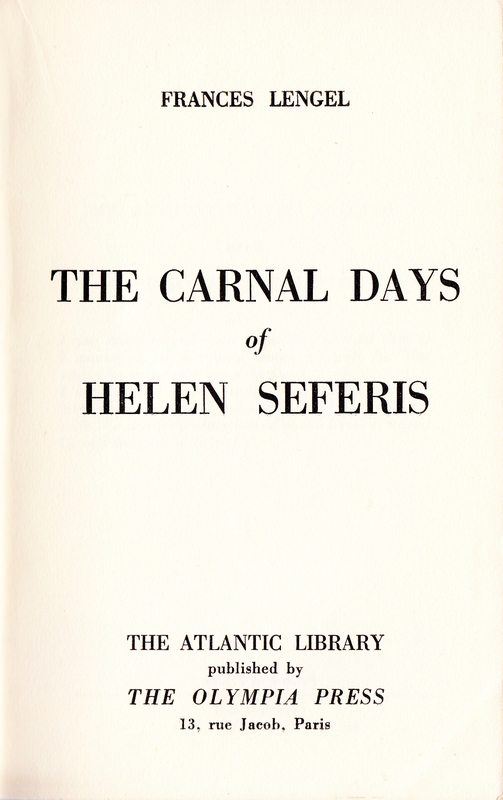 Front cover: [printed in black and all contained within a white oblong frame matching proportions of book:] FRANCES LENGEL | THE | CARNAL DAYS | OF | HELEN | SEFERIS | THE ATLANTIC LIBRARY‘. Spine: [lettered in white up spine, and all within a black panel:] THE CARNAL DAYS | [in white across bottom of spine:] 7. 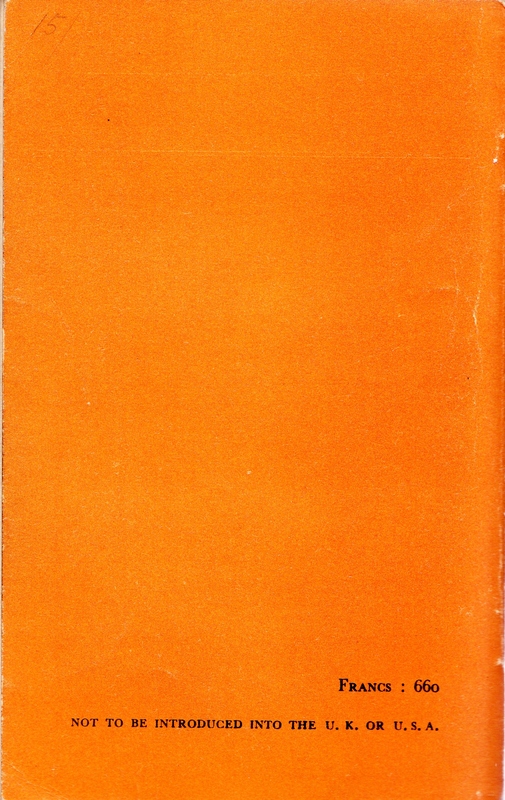 Back cover: [in black:] FRANCS : 660 | NOT TO BE INTRODUCED INTO THE U.K. OR U.S.A.
BIBLIOGRAPHICAL Description provided courtesy of Patrick Kearney The Paris Olympia Press. The Liverpool University Press 2007.